My friend Sue picked up on something I left out of my post about identifying the skull first believed to be that of King Henry IV of France. When I explained that I had done so deliberately, we decided the fact – new to us both – needed a post of its own. Lending his support to the theory that the mummified head is not that of the king, French historian Philippe Delorme pointed out that it showed no signs of craniotomy, which would have been typical for the time. The surgery would have been performed on a royal suffering from infection, head trauma, or other ills. 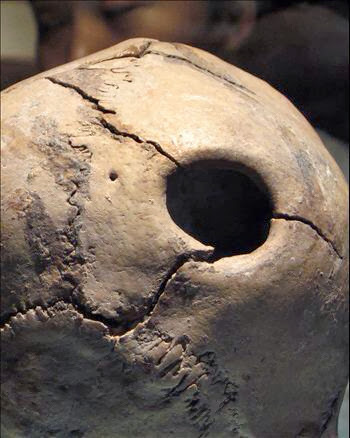 Trepanation on the living would show signs of healing like this 5,000-year-old Chinese craniotomy (IMAGE ABOVE). But removal of a disk of bone that had sharp edges would indicate that a "rondel" had been harvested from the dead king. These coin-sized plugs were apparently worn around the neck as amulets. The only information I could find about this was from an Italian medical journal. G. Sperati writes in 2007, "According to the most popular theory, the very first cases of craniotomy were probably performed, by prehistoric man, for reasons related to magic or religious rituals, or...as part of a ritual related to exorcism, to offer a way of escape to the demons and malignant spirits whom they believed had infested the person. As proof of the great religious importance attached to those who had been subjected to drilling, it is worthwhile recalling that, from some of these skulls, diskettes of bony tissue were removed post mortem, which were then worn as amulets around the neck (the so-called “rondelles”, described for the first time, by Prunières, in 1783)."